Chunky Moebius Cowl is an original PlanetJune Accessories crochet pattern by June Gilbank. 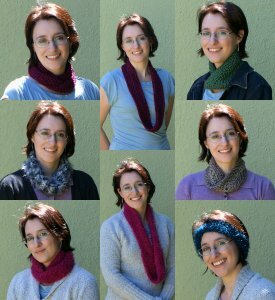 This unisex cowl pattern is infinitely versatile: make it as a short, snug neckwarmer, or a long loose infinity scarf that can be wrapped twice around your neck; make a narrow cowl for warmer days or to wear doubled, or a tall snuggly cowl for maximum warmth. You can even make a headband version to keep your ears warm! With simple stitches and no turning or seaming, this pattern is amazingly fast to work up using a large crochet hook and bulky yarn, so it's perfect for last-minute gifts. Use this pattern as a stashbuster for a single skein of bulky or novelty yarn, or hold two strands of a finer yarn together to make your own custom colour-blend! Date Added: 11/22/2015 by Annette P.
Date Added: 10/31/2013 by Chrisie M.
Date Added: 10/31/2013 by Judy C.
Date Added: 09/28/2013 by Heather L.
Date Added: 12/09/2012 by Simone N.